The HVAC companies are increasingly integrating IOT technology with HVAC equipment due to growing demand for real time insights from HVAC equipment. The Internet of things is the inter-networking of physical devices embedded with software, sensors and network connectivity which enable these objects to collect and exchange data. Using IOT, HVAC systems are closely monitored and controlled from remote locations. Real time monitoring, predictive maintenance, remote diagnostics, system adaptation, continuous comfort, increased efficiency, focus on user experience are some of the features of IoT enabled HVAC equipment. According to Emerson Climate Technologies, 33 percent of thermostats, a device that automatically regulates temperature sold in 2014 were Wi-Fi-enabled and it is expected to become 75% by 2019. Western Europe was the largest region in the ventilation, heating, air-conditioning, and commercial refrigeration equipment manufacturing market in 2017, accounting for more than one-third of the market share. This was mainly due to the large number of industries, data centres and offices in the region demanding large-scale ventilation and heating systems. According to The Business Research Company’s Consultant, Nitin Gianchandani, mobile applications are being widely used by HVAC manufacturers for equipment maintenance and to handle service requests. These applications cover a wide range of operations in HVAC industry such as service management, access to information, evaluating performance parameters such as energy and pressure that will enable HVAC companies to carry out preventive maintenance. For example, ‘ME Engineer’ an application from Mitsubishi Electric provides customers and service engineers access to information from Mitsubishi technical experts and enable them to diagnose machine breakdowns. United Technologies Corporation was the largest player in the ventilation heating air-conditioning and commercial refrigeration equipment manufacturing market, with revenues of $16.9 billion in 2016. UTC’s growth strategy aims at increasing its presence globally by acquiring companies offering similar products in multiple geographies. In 2015, the company acquired CIAT, a French HVAC company to improve its visibility in European market. It also acquired commercial HVAC product sales and commercial service divisions of AHI-Carrier in Australia in 2016. 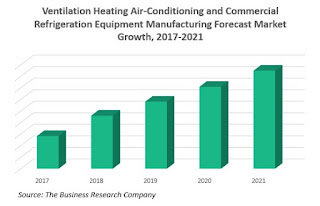 The HVAC equipment manufacturing industry includes companies offering manufacturing ventilating, heating, air-conditioning, and commercial and industrial refrigeration and freezer equipment. HVAC system consist of interconnected mechanical systems that provide thermal comfort and air quality in an indoor facility. Ventilation Heating Air-Conditioning and Commercial Refrigeration Equipment Manufacturing Global Market Report 2018 is a detailed report giving a unique insight into this market. The report is priced at $6000 for an individual user. To use across your office, the price is $9000 and $12000 if you wish to use across a multinational company.